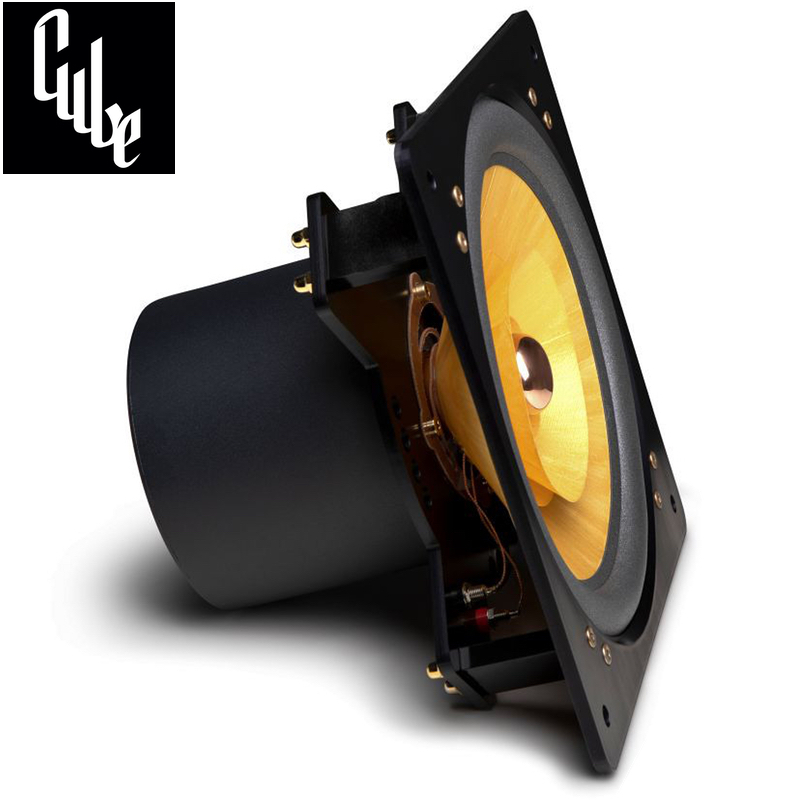 We believe that full range speakers can create an illusion of live music that multi-way loudspeakers struggle to match. 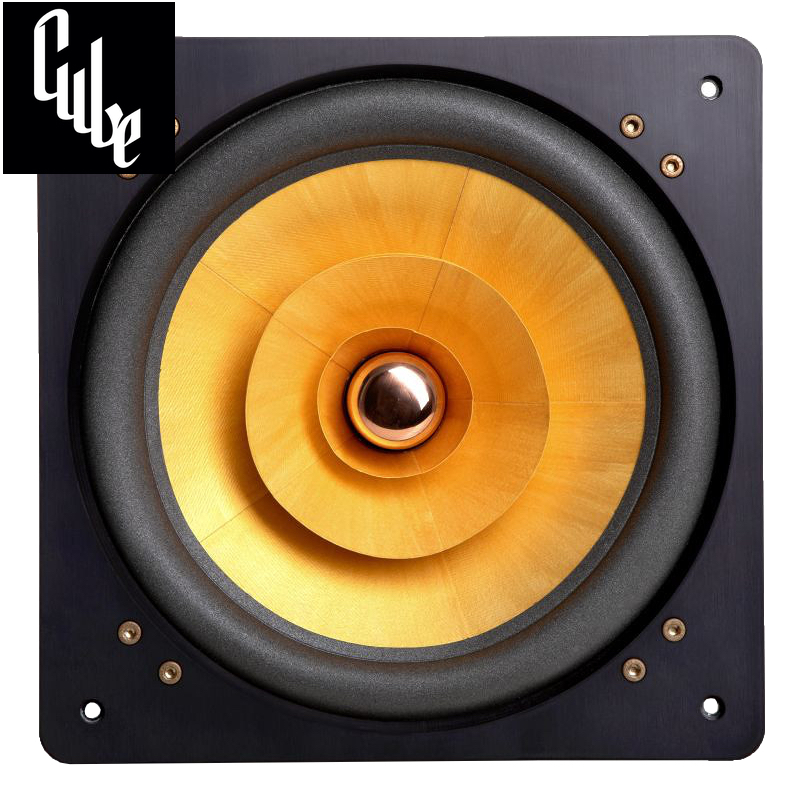 Amazing sound-stage, absolute holography, magical midrange, open and direct sound that gives you the most emotional presentation possible of your favourite music. 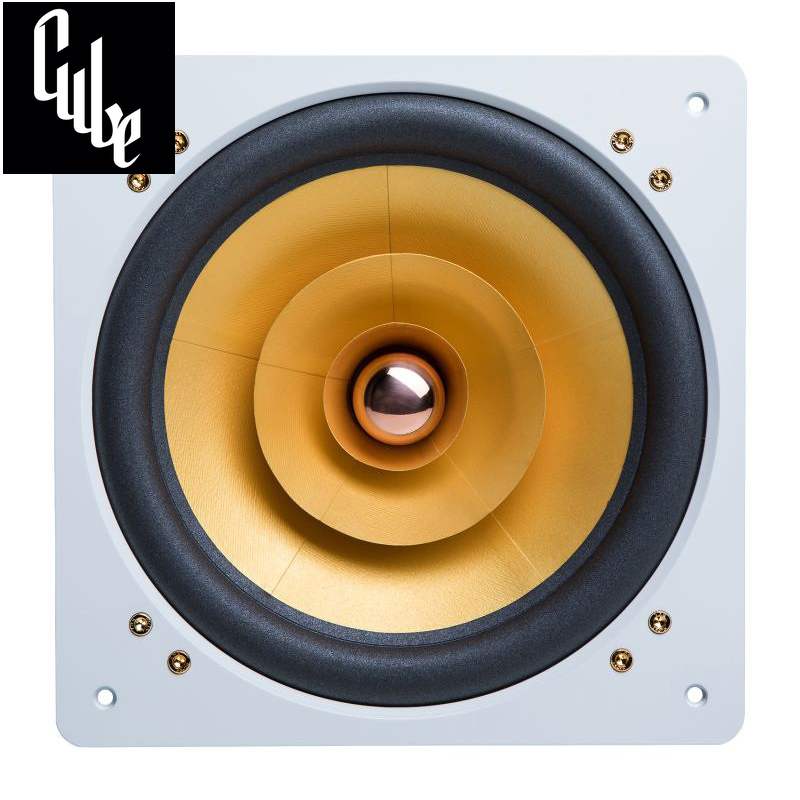 We are very happy with the performance of Cube Audio 8" drivers. There have been positive feedback from our happy customers, very enthusiastic reviews, but there still was this ... "we should do more". We knew that if we wanted to go into even more full range regions, we would have to increase the size of the driver. The answer was 10" design, and we are very happy that it was our first choice. First of all, the size increase is meaningful enough so that it really makes a difference, but on the other hand, we had to overcome plenty of traps place by mother nature. Physics is heartless and it really did everything it could to play with us "the hard way". The process of designing and fine-tuning 10" drivers took us over a year. The goal was to end up with something completely new, that outperforms our 8" inch drivers in nearly all aspects. To reach our dream performance one thing was sure, due to increased moving mass, a more powerful motor was necessary. 2 new motors were developed for that purpose. One being mixed ferrite & neodymium magnets assembly and the second one is constructed completely out of neodymium magnets. 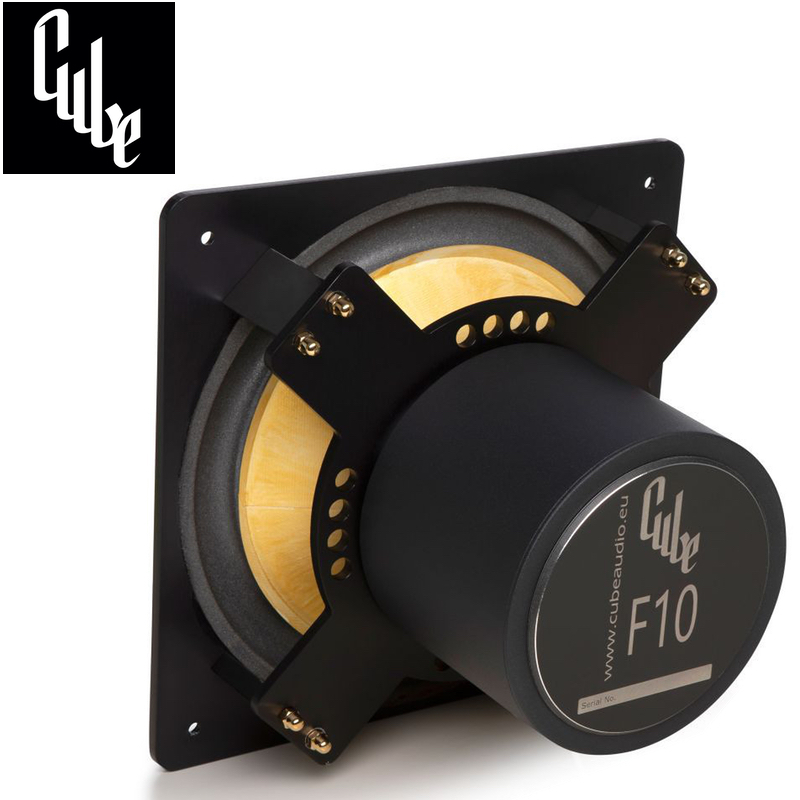 The mixed magnet motor contains 8 kg ferrite magnets and a strategically placed 300 g neodymium one. The motor provides a magnetic field of 2.1 Tesla in a gap that is 9 mm in height. After conducting many tests the solution was found and it turned out to be even better than we expected. 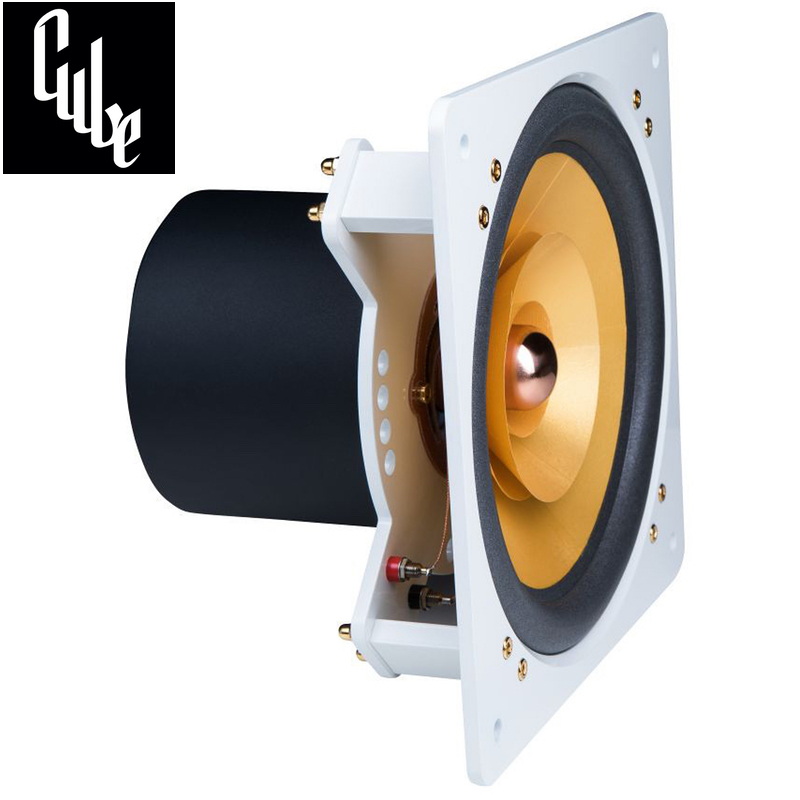 It is 100 % linear within the maximum excursion of the speakers ( + - 6mm). It behaves like a spring. It does not consume the energy by damping, it just positions the voice coil in the magnetic gap. The downside of such technology is that each spider has to be milled with the precision of a CNC machine. Nevertheless, the advantages are obvious and totally worth it. In order to measure the actual compliance (amount of excursion under known force) of the suspensions, we designed and custom made a special device. 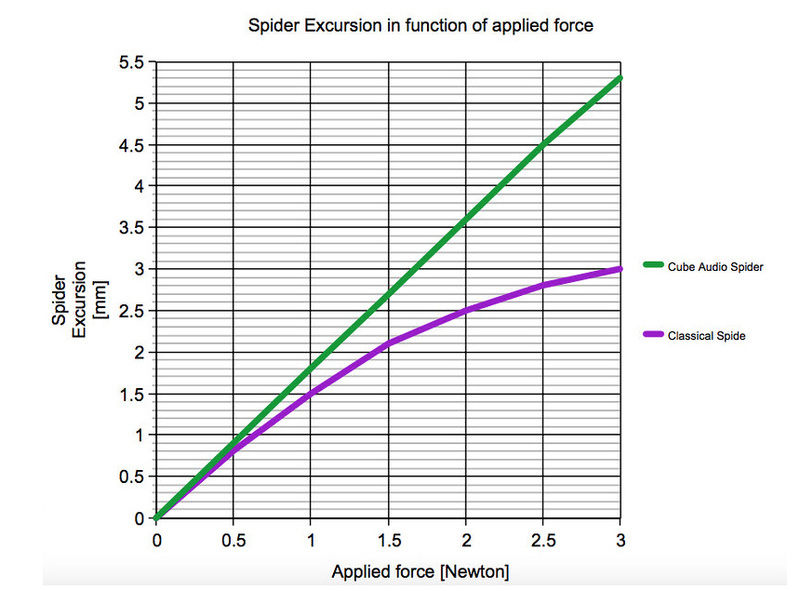 You can see the graph with measurement comparison of our suspension and classical (resin soaked cloth) spider below. See the spider excursion graph link below. It was definitely worth it. The final design consists of 4 cones. One being the main cone and 3 whizzer cones. The smallest cone is responsible for the highest frequency range. With only one standard whizzer we never would never be able to go up to 18 kHz with a driver that in proper cabinet reaches 30 Hz region. So adding that little whizzer, solved one of the issues that we had. But there were plenty more of them. When you add a whizzer to the cone, there is additional interference between the cone and the whizzer. The mini high frequency whizzer and the main whizzer got together really well and the sound was way better than without it. There was still a geometry issue present though. Its diameter, height, surface, geometry, stiffness, damping, coating all are a part of final sound equation. To achieve the right amount of sound pressure in the desired frequency region the most important of them all is geometry. There was one geometry that gave us amazing rich, colourful midrange, but on the other hand, it interfered with the main cone in such a way, that the mods were pumping up mid frequencies. Since "shouty" vocals were not desired, we had to do something about it. Here's where the third whizzer comes into play. That is a very elegant solution to change the interference mods of the whizzer and the cone. Due to changed geometry and distance, the amplitude of the modes decreased. As a result, the overall sound became sweeter, richer and more natural. At that moment we knew that this is the way to go.